Time was when flipping was something you did with coins and pancakes, but not at the same time. The last time I flipped pancakes was over a gas burner, out camping in the wilds of Western Australia. Things you learn when you’re knee high in Mum’s kitchen stay with you down the years. But these days, we’re getting a little more sophisticated in making the lessons stick. It’s not just pancakes. It’s now the whole classroom. The new approach to uni teaching is called flipping the classroom. The idea is to turn the learning process around so that the student is the centre of gravity. Student-centred learning doesn’t have to be high tech, but IT has opened the door on a swag of new instructional media. How better to teach the geeky aspects of lab medicine than with the IT that students live and breathe. 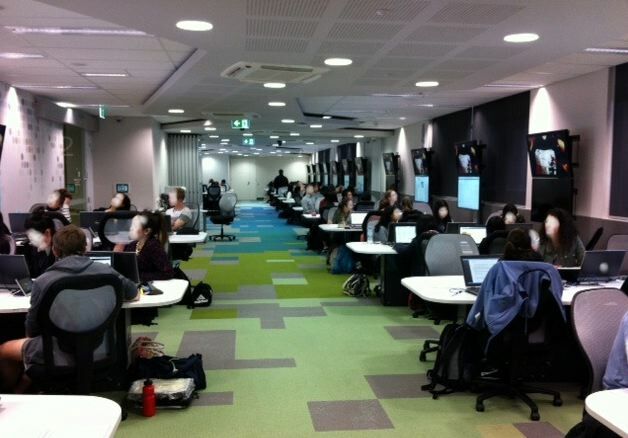 Hence the brand new eLearning Centre at UWA’s School of Pathology and Laboratory Medicine. 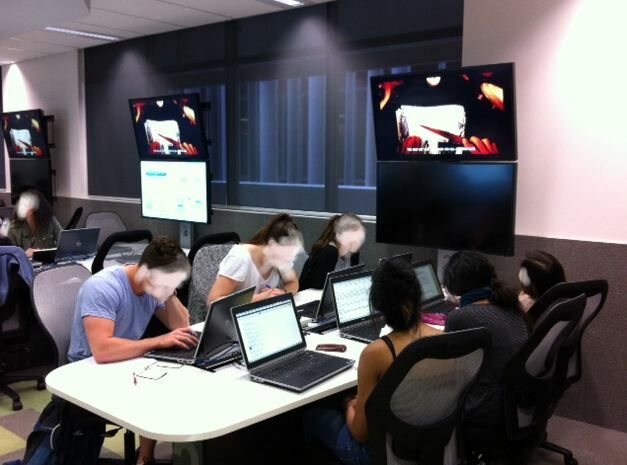 It’s a wet lab that had a makeover, transforming it into a cluster of eLearning pods. The pods are small group computer benches where the main learning transactions take place. Duplicate LED screens overlook each pod. One tutor armed with a radio mike and a control panel can display content on the upper screen, or both screens can be used by group members to compare and share. Peer tutoring happens when students have the tools to work their tasks together. Our task was to introduce malaria and tuberculosis in a two hour ePractical, and this is how we did it. We designed a worksheet with a series of questions that followed a journey through key learning points. Embedded hyperlinks gave students a start into key opinion sources. We then served up an on-line quiz on the content one week before the ePrac aiming to set the standard ahead of the ePrac. At the start of the ePrac lab session, we briefed our handful of clinical tutors to avoid direct answers and instead to engage the questioner with the help of on-line information sources. However, we did encourage discussion and debate with clinical tutors. Teaching staff took on the role of subject-matter guides and navigators. Finally, we set the scene with a video cartoon to mark the start of our new approach to teaching. Additional videos punctuated the two hour class, pulling groups that had wondered off topic back onto the route the rest of the class were following. These were not a substitute for tutor-student interaction, or small group conversation. The jury is out on how well this avant garde approach to teaching went, at least until the end-of-semester results come in. Clinical tutors enjoyed the class as much as the students, and were not phased by their change of role. The control console/radio mike combo allowed a single tutor to handle a huge class, yet spend most of the class providing targeted input to specific questions from small groups. Awesome, wish I was a student again. Always had a blind spot in HIstology, Microbiology, and Pathology, because really did not peering under the microscope. But with this device and app, called the MultiTouch Microscopre at http://internetmedicine.com/2013/09/24/multitouch-microscope-great-tool-for-historlogy-microbitology-and-pathology/ those subjects would be much easier to underdand and teach.